Renovating your kitchen is a big undertaking. It’s expensive for a start, plus the result will have a significant impact on your home and family life. It is, therefore, important you get it right. Here are eight common kitchen renovation mistakes you should avoid. A professional kitchen designer will avoid all these issues and more. Thinking Only About Style – The style of your kitchen is incredibly important as it’s a reflection of your personality. Also, you should enjoy spending time in the kitchen which you can only do if you like the way it looks. However, problems arise when style is the only consideration. After all, kitchens have a functional role too, so this should also be considered. Moving Plumbing – There may be good reasons for moving plumbing, but it’s an expensive option. Don’t, therefore, make this decision on a whim. If it’s a conscious choice and you’re happy with the additional expense, go for it. Otherwise, try to leave the plumbing untouched. Not Including Enough Storage – It’s almost impossible to have too much storage in a kitchen so you should avoid cutting back on storage space. Your kitchen designer will know this, but it’s important you’re aware of the need for storage too. Also, make sure you utilise all the space available. In most kitchens, there is a lot of space that is not used at all, or not used well. These spaces can give you storage without compromising on other aspects of the kitchen. Failing to Ensure there is Enough Light – Lighting is one of the most important elements of kitchen design. Specifically, you need to ensure there is adequate lighting for all times of the day – natural light during the day where possible, and artificial light for night time. Also, the type of light you choose is important, i.e. the light should feel as natural as possible, even at night. Not Setting a Budget or Failing to Stick to the Budget – Renovating your kitchen is a significant investment so it’s essential you have a budget in place. You should do this before you start looking at kitchen ideas or drafting plans. Also, make sure the budget guides you through every decision to avoid spending more than you should. Choosing Appliances at the End – It’s easier to choose counters and units that fit appliances than the other way around, so choose your appliances at the start of the project. Not Having a Plan for While the Work Gets Done – Finally, there will be inevitable upheaval in your home while the renovation work is being done. Make sure you have a plan in place while this is happening, particularly in relation to feeding children. 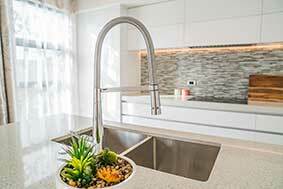 Avoiding these mistakes will help ensure you get the kitchen you want while making the renovation process easier.